10" & 12" Vinyl Record Warp Treatment service. Warp treatment service using specially designed equipment to give the best possible results in a carefully controlled environment. We can normally significantly reduce warps and usually completely remove them. (Please be aware that we are unable to guarantee the final outcome of this treatment due to the considerable variances in the quality of vinyl used in the manufacture of records). This service does not work with shellac 78s although vinyl 78s can be treated. We have specially designed mailers and cartons for 10" & 12" records if required - see 'Mailers' above. 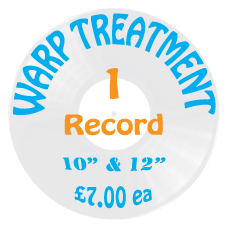 Normal turnaround for our warp treatment service is 10-14 working days from receipt of records. Warp Removal Flattening Service10" & 12" Vinyl Records Only1) Put the number of records you..